Stockings on a fireplace mantel. 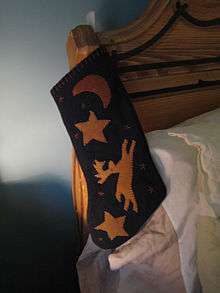 A Christmas stocking hung on a bedpost. A Christmas stocking is an empty sock or sock-shaped bag that is hung on Christmas Eve so that Santa Claus (or Father Christmas) can fill it with small toys, candy, fruit, coins or other small gifts when he arrives. These small items are often referred to as stocking stuffers or stocking fillers. In some Christmas stories, the contents of the Christmas stocking are the only toys the child receives at Christmas from Santa Claus; in other stories (and in tradition), some presents are also wrapped up in wrapping paper and placed under the Christmas tree. Tradition in Western culture threatens that a child who behaves badly during the year will receive only a piece or pile of coal. However, coal is rarely if ever left in a stocking, as it is considered cruel. Some people even put their Christmas stocking by their bedposts so Santa Claus can fill it by the bed while they sleep. Very long ago, there lived a poor man and his three very beautiful daughters. He had no money to get his daughters married, and he was worried what would happen to them after his death. Saint Nicholas was passing through when he heard the villagers talking about the girls. St. Nicholas wanted to help, but knew that the old man wouldn't accept charity. He decided to help in secret. After dark he threw three bags of gold through an open window, one landed in a stocking. When the girls and their father woke up the next morning they found the bags of gold and were, of course, overjoyed. The girls were able to get married and live happily ever after. Other versions of the story say that Saint Nicholas threw the three bags of gold directly into the stockings which were hung by the fireplace to dry. This led to the custom of children hanging stockings or putting out shoes, eagerly awaiting gifts from Saint Nicholas. Sometimes the story is told with gold balls instead of bags of gold. That is why three gold balls, sometimes represented as oranges, are one of the symbols for St. Nicholas. And so, St. Nicholas is a gift-giver. This is also the origin of three gold balls being used as a symbol for pawnbrokers. A tradition that began in a European country originally, children simply used one of their everyday socks, but eventually special Christmas stockings were created for this purpose. The Christmas stocking custom is derived from the Germanic/Scandinavian figure Odin. According to Phyllis Siefker, children would place their boots, filled with carrots, straw, or sugar, near the chimney for Odin's flying horse, Sleipnir, to eat. Odin would reward those children for their kindness by replacing Sleipnir's food with gifts or candy. This practice, she claims, survived in Germany, Belgium and the Netherlands after the adoption of Christianity and became associated with Saint Nicholas as a result of the process of Christianization. Today, stores carry a large variety of styles and sizes of Christmas stockings, and Christmas stockings are also a popular homemade craft. This claim is disputed though as there is no records of stocking filling practices related to Odin until there is a merging of St. Nicholas with Odin. St. Nicholas had an earlier merging with the Grandmother cult in Bari, Italy where the grandmother would put gifts in stockings. This merged St. Nicholas would later travel north and merge with the Odin cults. Many families create their own Christmas stockings with each family member's name applied to the stocking so that Santa will know which stocking belongs to which family member. The former World's Biggest Christmas Stocking was created by supporters of The Children's Society in December 2007. Guinness World Records awarded the stocking the title of the Largest Christmas Stocking on 14 December 2007 at ExCel in London. It was made out of over 6,000 squares of red knitting and measured 32.56m long, and 14.97m wide (heel to toe). It weighed the equivalent of three Reindeer and was filled with 1000 presents, which were then given to children in The Children's Society's projects. The stocking was created as part of The Children's Society's knitting fundraising appeal, 'The Big Stitch'. £14,000 was raised through sponsorship. David Madera, the previous holder of the title had broken the record in Solomons Island in December 2010 with a stocking measuring 27.46 meters by 11.3 meters. 1 2 Morris, Desmond (1992). Christmas Watching. Jonathan Cape. pp. 14–15. ISBN 0-224-03598-3. 1 2 Bowler, Gerry (2000). The World Encyclopedia of Christmas. Toronto: McClelland & Stewart. p. 156. ISBN 0-7710-1531-3. ↑ "Three Impoverished Maidens". St. Nicholas Center. Retrieved 2013-11-17. ↑ "Origin of Christmas | The history of Christmas and how it began". Simpletoremember.com. 1941-12-25. Retrieved 2013-12-27. 1 2 "The World's Biggest Christmas Stocking". Childrenssociety.org.uk. 2007-12-18. Retrieved 2013-12-27. Wikimedia Commons has media related to Christmas stocking.